In 2012 local residents in Burley held many fund raising activities to celebrate the Queens diamond jubilee. When all the celebrations were over the Parish Council were left with a small surplus of money and decided to ask the residents what they would like to do with it. The majority view had a leaning towards providing something permanent for the village, which would mark the Queens Jubilee, be sympathetic to the environment and benefit the village as a whole. 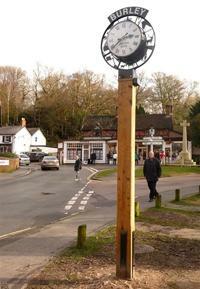 The Parish Council gave the community the opportunity to put forward ideas on what shape this would take and the idea of a clock on the form of a village sign was suggested and received popular support. The project has taken place under the leadership of Councillor Neal Martin, who contacted clock manufacturer Good Directions Ltd of Botley, Hampshire to work with local artist Suzan Houching who has been involved in the design aspects of the clock. It has been important to ensure that the design is a true reflection of the village and captures the essence of Burley, the animals and the Forest Environment. The border of the clock is made up of eight images, which depict the crown and scenes from the village and forest. One scene includes two children who represent the younger generation and the future of the Forest. 20/12/2016 - Two Great British clock manufacturers join forces as Good Directions Ltd acquires Shire Clocks Ltd.
14/08/2013 - Two Great British manufacturers join forces as Good Directions Ltd acquires Neptune Outdoor Furniture Ltd.
11/07/2011 - Good Directions Ltd manufactures bespoke clock for new Disney store in London. 06/07/2011 - Pupil wins replica clock for designing a new large exterior clock for Darrick Wood school. 06/07/2011 - 4m high exterior clock feature manufactured for new park in Azerbaijan. 18/05/2011 - Good Directions new landmark exterior clock for Banbury unveiled by the Mayor. 17/05/2011 - Harrods choose Good Directions to manufacture Big Ben replica for new signature room. 05/05/2011 - World's largest Grandfather clock manufactured by Good Directions Ltd? 20/04/2011 - A new pavement clock for Windsor installed with time capsule hidden below.